I’ve been looking for warm, versatile dress patterns for my girls. 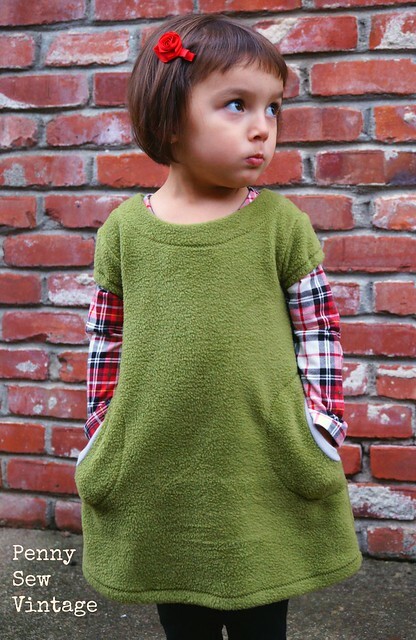 My older daughter has this lovely fleece dress from Old Navy, and since she’s close to outgrowing it, I’ve been on the hunt for a similar dress pattern. I was so excited to then be given the opportunity to test the New York Minute Dress by TieDyeDiva! What are the chances things would align that way?! This dress is perfect for fleece, sweater fleece knits, and thicker knits like that, with 25-35% stretch. It comes with facing, ribbed, and hood neckline options, two pocket options, short and long sleeve options, and a hemmed or ribbed hemline and is available in sizes 12-18mos through 9/10. I decided to make the long sleeve version with ribbed neckline and hemline, and ribbed finish inset pockets first. 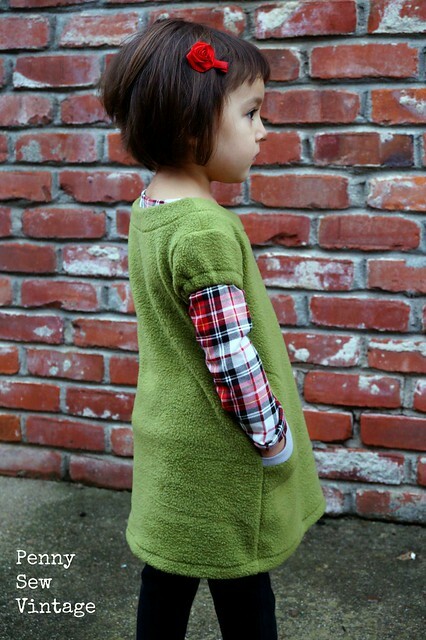 I also lengthened the pattern for a size 2T, including lengthening the sleeves. My girl is a thin little thing! Since I was using a very simple fleece knit, I decided to make this my girl’s holiday dress by adding a reindeer appliqué to the front. I spiced it up with hand stitching, sequins, and a button nose, you know, just to make it even cuter. The construction was very simple, and the pattern instructions are thorough. I used my serger for most of the construction, using my sewing machine and a zigzag stitch to attach the pockets. I really love the pockets! I couldn’t believe how freaking adorable this dress turned out, and my little sweetie just loves it to boot! She was having fun posing for the camera too which just cracked me up, and her big sister kept trying to make her laugh the whole time. I love these girls! A view of the back. It’s roomy enough for active girls to run around and play in. I paired the dress with these Sterling leggings, also from Tie Dye Diva, in a size 2T. 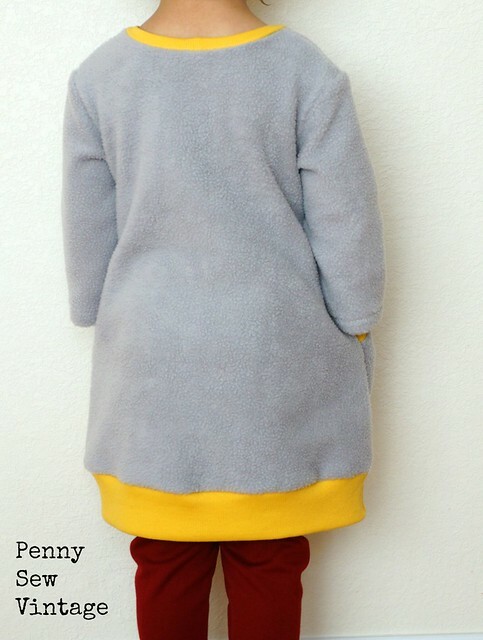 I used a deep red ponte that is perfect for colder weather. The rise in these were just a tad higher than my other leggings’ patterns, and they fit my girl perfectly. We’ve been having problems with other leggings being too short in the front. Well, after such a huge success with my first version, I decided to make another one. 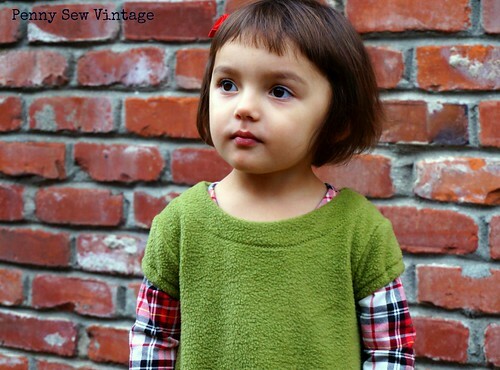 This time I used the facing neckline option with short sleeves, and I added the elastic to the short sleeves to make them a little girly, especially because I was using this green fleece. I also hemmed the bottom instead of using a band. Again, LOVE the way this one turned out too! We layered it since it was cold out, and I really like this look too. The neck opening is also large enough to pull over her head easily without needing a closure. She just can’t get enough of these pockets. She absolutely loves these dresses, so I’m going to have to make more for sure! I can’t believe how big my little girl is getting. She’s also doing such a great job letting me take her picture lately which I’m just eating up. Tie Dye Diva has released the pattern for the New York Minute dress, and it’s on sale for $5.95 through 12/13. And look, my girl made the cover of the pattern! 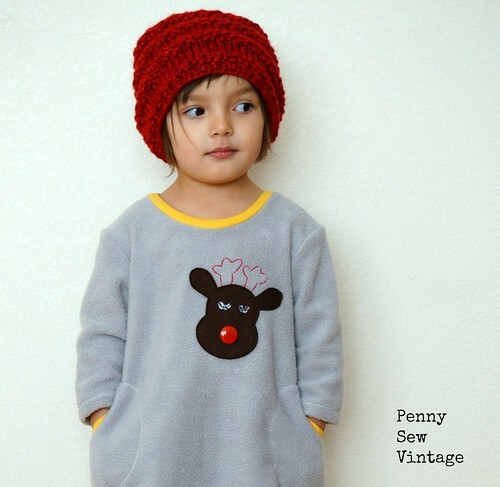 We really love this pattern, and it’s such a quick gratification sew. Oh, and there’s also a tutorial in the pattern to make it a hooded pullover which is great for boys too. I’m doing that one soon as I have leftover fleece. Alright, so here you can find the Reindeer Appliqué pattern. If you share the pattern, please include the link to my blog instead of directly to the pattern. Much thanks! Let me know if you have any problems or questions with it too.